The research draws from an online survey targeted primarily at younger tribal citizens living away from tribal lands; this project provides preliminary insight into 1) non-resident citizens' engagement with their tribes, and 2) the ways tribes might connect more effectively with non-resident citizens, should they choose to do so. Schultz, Jennifer Lee, Stephanie Carroll Rainie, and Rachel Rose Starks. 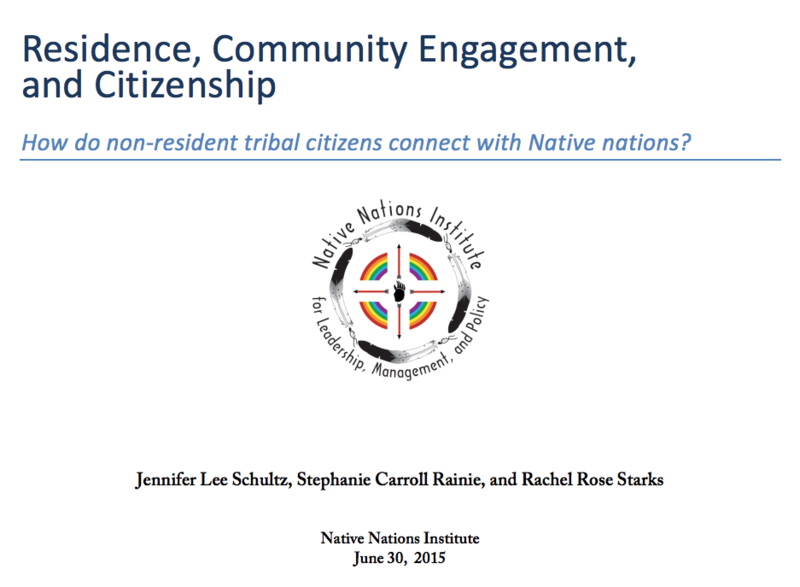 Residence, Community Engagement, and Citizenship: How do non-resident tribal citizens connect with Native nations? Connecting Across Distance & Difference: Tribal Citizenship in a New Era. The NCAI Policy Research Center Tribal Leader/Scholar Forum. National Congress of American Indians Mid Year Conference. St. Paul, Minnesota. June 30, 2015. Paper.